The colourpoint pattern is a form of albinism and is known as the "Himalayan pattern" (often called "Siamese" pattern by cat lovers). It is found in several mammals including rabbits and goats from the Himalayas region. The exact effect of the gene depends on the temperature since its effect is inhibit colour in warm areas of the body and allow colour to develop on the cooler areas such as the ears, face, legs, tail and (in males) scrotum. In warmer climes, there is less contrast between the body colour and the point colour. Colourpoint kittens are born with almost pure white coats on a pink skin because of the uniform warmth in the womb; only after birth does the point colour develop. In cooler regions, the contrast may be very pronounced. The characteristic blue eyes reflects reddish at night because albinism affects the tapetum (reflective layer) of the eye; non-albino cats' eyes reflect greenish. The most familiar colourpoint breeds are the Siamese and Himalayan (Colourpoint Longhair/Colourpoint Persian), but there are a number of others. Most, if not all, colourpoint cats have Siamese somewhere in the history, or at least have Thai, Asian or Japanese cats in the family tree since this pattern occurs naturally throughout Asia and into Russia. The Burmese has a "low contrast" form of the colourpoint gene andthe Tonkinese is halfway between Burmese and Siamese. There are a series of gene variants and combinations controlling the contrast between body colour and point colour. The Himalayan is a Persian in a colourpoint coat and with blue eyes. In the UK it is known as the Colorpoint Longhair (or Colourpoint Persian). In the USA, Himalayans with tabby or tortie points are known as Colorpoint Longhair in some registries. Experimental breeding of Siamese and Persians dates back as far as the 1920s. The first recorded deliberate cross between Siamese and longhaired cats was made by Swedish geneticist T Tjebbes in 1924 using white longhairs. However it was not his intention to create a new breed for the cat fancy. In 1931 in the USA, Virginia Cobb and Dr. Clyde Keeler began an experimental breeding programme with the purpose of learning the inheritance involved in producing a Colourpoint Longhair. In 1936, they produced the first Himalayan kitten. They published an article about colourpoint inheritance in the American Journal of Heredity. Having accomplished their aim, the breeding programme was abandoned. In 1932, the French work "Nos Compagnons ...Les Chats" depicted a colourpointed Persian cat. In 1949, Sydney W France's book "Siamese Cats" also mentioned the crossing of Siamese cats with Persians, a practice which eventually led to the now familiar Colourpoint Persians (Himalayans), though in 1949, such breedings were regarded with a mix of curiosity and disapproval. "Some curious experiments have been made from time to time in an effort to cross Siamese cats with Persians and even the tabby cat, and at least two treatises have been written on the subject. 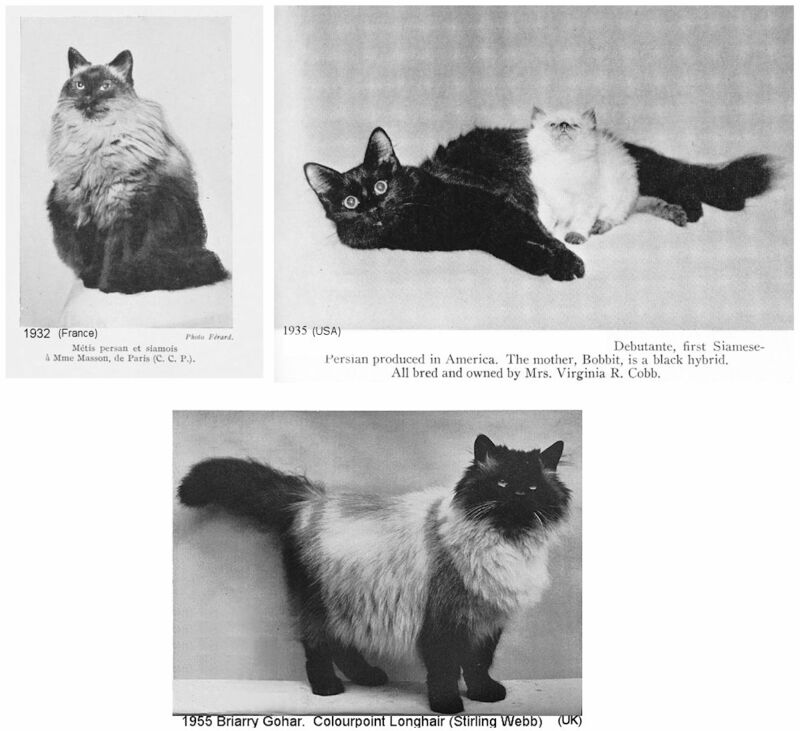 "Siamese-Persian Cats" by Clyde E. Keeler and Virginia Cobb, "Journal of Heredity" v. 27. No. 9. Sept. 1936, and "Crosses with Siamese Cats" by K. Tjebbes, Journal of Genetics, V. 14. p. 335, 1924. From this we find that Swedish Dr. K. Tjebbes in about 1924 crossed a white Persian female with a Siamese and the colour of the Persian dominated to the extent of seven white kittens and three coloured ones. Back crosses all gave 50 per cent. white. Like Siamese colouring, short hair dominated. It took Mrs. Virginia R. Cobb five years of experiment working in conjunction with Dr. Clyde E. Keeler of the Harvard Medical School to produce the first successful experiment and breed long-haired Siamese kittens, using black Persians instead of white, as used by Dr. Tjebbes in his experiments. Only pedigree cats were used, and from each litter only the most perfect kittens were selected, to be mated up in due course to carry on the experiments. A black Persian male was mated to a Siamese female, and a Siamese male was mated to a black Persian female. The kittens in every case were black and short-haired. After a time a female of one of these litters was mated to a male of the other, and produced among her kittens a long-haired black female! this female being bred back to her short-haired black father. She subsequently had a litter containing two Siamese-Persian kittens which had the long hair of the Persian and the markings of the Siamese. This mating was repeated and of the eleven kittens three were long-haired Siamese, the other eight being black. These three long-haired Siamese kittens had the blue eyes of the Siamese, and the same voice, which they used just as often as the true Siamese do. In 1939 when Ida M. Mellen reported these facts in her practical cat book the experiments were still proceeding." In 1931, Virginia Cobb (Newton Cattery) and Dr. Clyde Keeler (Harvard Medical School) conducted an experimental breeding programme to produce a Colourpoint Longhair. They wanted to study the inheritance of longhair and colourpoints to produce a "longhaired Siamese". They first crossed Siamese with Black Persians. This resulted in black shorthair kittens. They mated the offspring together and achieved the desired longhaired Siamese. 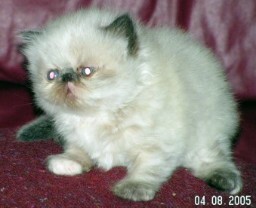 In 1936, Keeler and Cobb produced the first Colourpoint Longhair (Himalayan) type kitten, "Newton's Debutante". They published an article and the "formula" for producing her in the American Journal of Heredity and then abandoned the breeding programme. They had accomplished the goal of studying how the factors were inherited (longhair and colourpoint are both recessive), but did not intend to create a new breed. In Britain, at the Siamese Cat Club Show in 1947, Brian Stirling-Webb was approached by a cat owner, Mrs Barton-Wright, who wanted to mate her "long-haired Siamese queen" to one of his Siamese stud cats. She lived close to his Briarry cattery and was anxious to breed more long-haired Siamese, believing they would make a great addition to the Cat Fancy. Stirling-Webb disagreed and told her that she would get only short-haired kittens from mating her cat with a Siamese. Stirling-Webb had seen the results of Keeler and Cobb's experiments and described their longhairs as having Siamese type (far less extreme in type than modern Siamese). He had felt that Keeler and Cobb's experiments were the worst possible thing that could happen to the Siamese - the Siamese cats' beauty was due to their svelte outlines, which Stirling-Webb felt would be obscured by a long coat. Stirling-Webb therefore recommended either having the queen spayed or mating her to a Black Persian and then mating the offspring together. The owner was "averse to either course" and asked to take the queen to Stirling-Webb for him to see her for himself. Stirling-Webb later wrote: "When I saw this queen, I was astonished at her beauty. Apart from her colouring, she possessed practically no Siamese characteristics, and was reasonably Persian in type. I was also amazed that nothing was known of her origin due to the fact that she had been a stray living in a country churchyard for about six weeks before being adopted by this lady. The police had been informed of her adoption, and advertisements were placed in the local papers in an attempt to contact the original owner, but without success." The stray queen later became known as "Bubastis Georgina". Unfortunately her habits meant she was "quite unfit to live in a civilised house" and in spite of persevering with her, her adopter offered her to Stirling-Webb as a cattery cat. By then, Stirling-Webb was enthusiastic about producing colourpoint Persians (but emphatically against longhaired Siamese!). He was joined by Mrs SM Harding (Mingchiu cattery) and began to develop the variety further. He repeated Cobb and Keeler's "formula" and also acquired a Black Longhair male who had one Siamese grandparent. This male was mated to the colourpoint queen and they produced kittens close to his ideal. 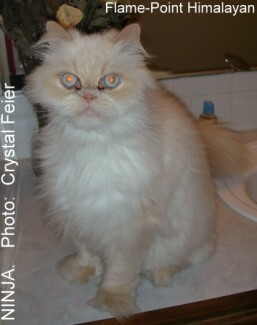 Getting GCCF recognition for Colourpoint Longhairs (Persians) was harder as he needed to produce 3 generations of Colourpoint Longhairs for it to gain breed status and his stock was becoming inbred. In 1955, the cats achieved breed recognition and to continue outcrossing his breeding stock. He recommended the use of "bad" Siamese (round-headed) in Colourpoint Longhair breeding programmes. From the outset, the variety was considered a colour variety of Longhair (Persian): Breed Number 13B. Side-effects of his efforts were the Self Chocolate Longhair (Briarry Bruno) and Self Lilac Longhair (Minghiu Lilac). In the 1940s and 1950s, Ben and Ann Borrett bred cattle at their Chestermere ranch in western Canada. They were also lovers of Siamese cats and became aware of Stirling-Webb's experimental breeding programme in England. The Borretts travelled to England to visit Stirling-Webb and to purchase several of his cats to start their own breeding program. Their experience as cattle breeders meant that the Borretts understood the amount of work required to establish the new breed and the need for multiple bloodlines. They built up a large cattery (Chestermere cattery) and developed several different and totally separate bloodlines. Only the very best cats from each generation were bred. In 1957, they exhibited two of their imported cats at an ACFA show in Calgary, Alberta, Canada and were asked to create the "Himalayan" breed standard (Himalayan is the name given to the colourpoint pattern in rabbits and goats from the Himalayan region). Around the same time, California artist and cat breeder Marguerita Goforth (Goforth cattery) agreed to look after a friend's cat. 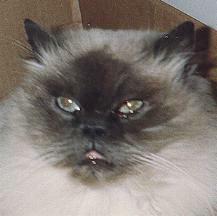 The cat was a seal-point Longhair called "Princess Himalayan Hope" and had come from the San Diego Humane Society. Goforth gained permission to breed the cat to create a Persian-type cat with Siamese colouring. When seeking acceptance for the breed in the USA, she used the Borretts' breed standard. In the 1960s, Goforth wrote that she regretted the decision to recognise the Himalayan as a distinct breed: "I have felt for many years that the Himalayan cat should be recognized as a colour of Longhair". While the Himalayans were kept separate from Persians they began to diverge in type, becoming a long-nosed, colorpoint longhair. In the 1950s, the Himalayan was recognised in the same 4 colours as the Siamese of the time: seal point, chocolate point, blue point, and lilac point. Red (flame) points and tortie points are recognised in the USA in 1964. Over the next several years these were joined by blue-cream point, cream point, lynx (tabby) points and tortie points. In 1984, the CFA made the Himalayan a division of the Persian breed. Only a few Himalayan breeders will ever breed bicolour Himalayans, using bicolour Persians to introduce the white spotting pattern. Paul Beall, Richmond, Texas is one such breeder. Paula's photo (left) shows a bicolour (piebald) Himalayan, but unfortunately this cat has not produced piebald-point kittens and Paula has decided not to reintroduce the gene from Persians. At present, Paula is working with the cinnamon gene in Himalayans; though the gene should have been present in Siamese cats used to develop the Himalayan, it does not seem to hve shown up in the Himalayn breed and breeders may have to introduce it using out-crosses to Persians. For a while in the 1950s there was a French breed known as the Khmer. 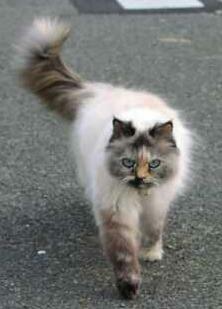 It resembled a semi-longhair colourpoint and was apparently overtaken by the Himalayan. "La Vie a Campagne", 1935 dated Khmers back to the 1920s and the photographs resembled early Colourpoint Persians. The story goes that a pair was taken to Paris and abandoned there by a returned serviceman from Indochina. By 1935, this strain of Khmer had evidently almost petered out. 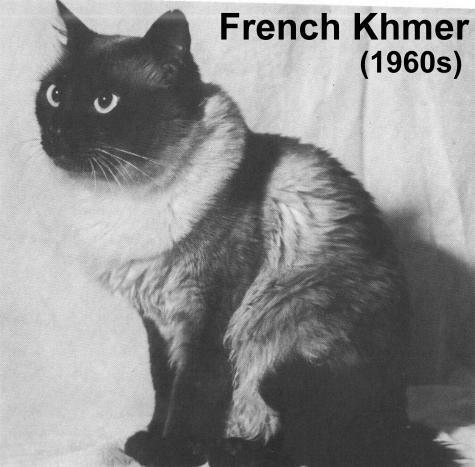 The French Khmer is also been described as a bootee-less Birman-type cat. The Khmer is described in an aside by Fernand Mery in 1966 when he describes the "Colourpoint Longhair" as being "remarkably like a breed recognised in France, the Khmer, which has its own standard in that country, though it is not recognised by La Federation Internationale Feline d'Europe". The term "Khmer" had actually been dropped in 1955. The Exotic Shorthair is a shorthaired version of the Persian. It was developed during the 1950s and recognised in the mid 1960s. The Colourpoint Exotic Shorthair is an Exotic Shorthair with colourpoint pattern and blue eyes. The advert from Cats Magazine (USA), April 1972, shows “Trimalayans” – seal bicolour-point Himalayans bred by Brandwyne cattery. The colour photo, an advert from 1994 from Lorraine Shelton’s collection, shows chocolate-and-white point Himalayans. Bicolour-point Persians/Himalayans are bred (the “Trimalayan” name didn’t stick), but are not accepted for showing. The Birman has the colourpoint pattern with the addition of white bootees/gauntlets. The Birman arrived in Europe around 1920 and has also been known as the Tibetan Temple Cat and the Sacred Cat of Burma. Modern Birmans are descended from a pair brought to Europe by Mr. Vanderbilt. It is also reported that 2 Englishmen, Major Gordon-Russell and August Pavie, then living in France, received a pair of Birmans from the Kittah people in 1919 as gratitude for their part in saving the temple from being overrun by invaders. The remainder of the tale is the same: the male unfortunately died during the voyage, but the female was pregnant. Of her kittens, only a female survived. This meant two female Birmans and no male. To re-establish the type, these cats were crossed to Siamese, Colourpoints and White Longhairs. In 1927, judge Mrs Basnett reported on the Paris Cat Show held on 14th and 15th of January by the Cat Club de France and wrote "The Sacred Burmese Temple Cats interested me very much, with their long fur on the tail and coat resembling that of a poorly bred Persian; their colouring is exactly like that of the Siamese, but their feet sometimes have white toes. I was given to understand that they are very difficult to rear, only about one in ten survive. I do not think they possess the same quick movements as the Siamese, life to them seems much more dreamy and slow, but they are very loving and intelligent." This clearly referred to the Birman; confusingly the name Burmese Temple Cat was also used at that time for the gold-eyed brown Thai cats analogous to modern Burmese or brown Orientals. As a result of its early near-loss and re-creation, some say the Birman comes from temples in Burma, while others claim it is a breed entirely manufactured in France using Siamese andblack-and-white longhairs. French breeders had to re-create the Birman not once, but twice since the Second World War caused pedigreed cats in Europe a great set back. Only two purebred Birmans survived and their offspring formed the new post-war foundation of the Birman breed in France. They were bred with other longhairs out of necessity, but by 1955, the Birman was once more recognised as pure bred and there was no more outcrossing. In the early 1960's Mrs Elsie Fisher and Mrs M. Richards imported the first Birmans into Britain from France. While some claim the cats were created in France, it is interesting that in 1960, a pair of "Tibetan Temple kittens" was given to a North American cat lover and were identical to the Birman cats being bred in Europe. 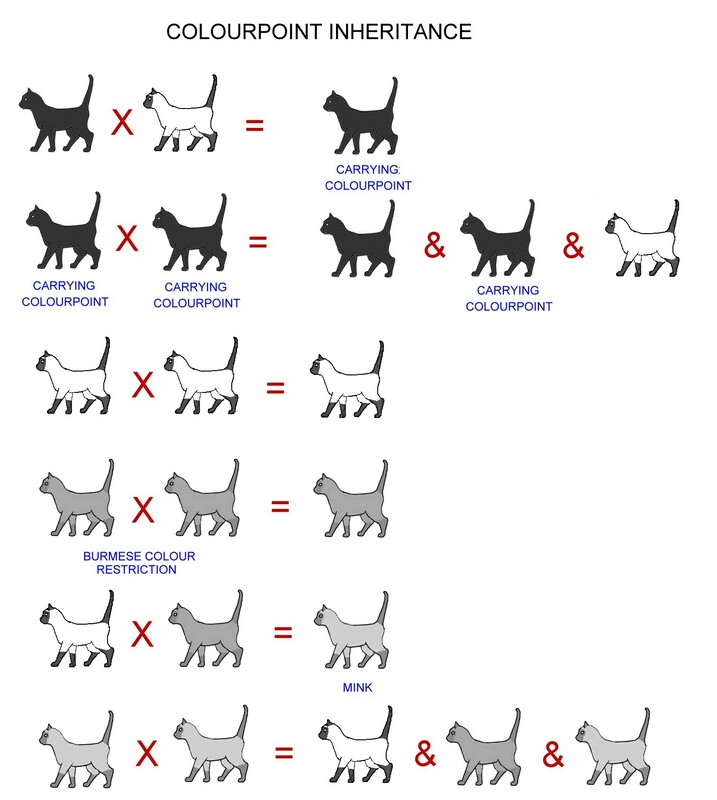 In recent years new point colours have been introduced, including chocolate, lilac point, red, cream, tabby and tortie point. Not all societies recognise the newer colours. It's worth noting that the older style of Birmans tended to develop "hood-type" head colouring. Early in the breeding of Birmans in the USA, Gertrude Griswold attempted to keep the Birman breed under her control. It was possible to adopt a female Birman from her for breeding, but to actually breed the cat, there had to be a notarized agreement (a contract with the Griswolds) that the sire would be of Gertrude Griswold's choosing and the adoption of the resulting kittens into new homes would be under her jurisdiction. Later on, Ann Baker attempted a similar degree of control over Ragdolls, another colourpointed breed. Birman variants are known e.g. the "Khmer" being a bootee-less Birman-type cat and the Tibetan being a Birman in solids colours and tabbies. Some of the early Birmans lacked the gauntlets. A French breed known as the Khmer was described by Mery in 1966. He noted the similarity of emerging colourpoint Persians (Himalayans) to the existing French Khmer, although the photographs of the Khmer suggested a semi-longhair or even a a fluffy, cobby colourpoint shorthair. Although Mery described it in 1966 and noted that it had a breed standard albeit one not recognised by FIFe, the term Khmer had been dropped back in 1955 when Colourpoint Longhairs and Himalayans were being developed in America/Canada and Britain respectively. There are earlier descriptions of the Khmer dating from 1935 (by which time it was close to being lost) and photos from that time depict a longhaired cat similar to an early colourpoint Persian. "La Vie a Campagne" in the late 1920s showed a longer haired Khmer, so possibly the coat length was seasonal. A pair of Khmer cats were supposedly taken to Paris from Indochina by a French serviceman - a tale very similar to that of the Birman. Two Birman were reputedly obtained by Major Gordon Russell from Burmese priests whom he had helped escape to Tibet; when he went to live in France in 1919 he took his Birman cats with him. This suggests that the French Khmer was a Birman that lacked the characteristic white markings of the Birman. This corresponds to the use of the term Khmer to describe bootee-less Birmans - and at one time there were indeed unsuccessful attempts to create"Himalayans" from Birman stock. The Templecat is the shorthaired equivalent of the Birman. It is a Birman in every respect apart from the slightly springy short hair. It was developed in New Zealand by outcrossing Birmans to a cinnamon spotted tabby Oriental. It began development in 1995 and was originally called the Birman Shorthair. It later became the Tsuncat (after a temple priest in mythology surrounding the Birman cat) and became the Templecat in 2001. The early colours were seal point, blue point, chocolate point, lilac point, cinnamon point and fawn point It is now also in red point, cream point and in tabby and toritie points. Ragdolls are medium to large boned, fairly long cats and possess the Siamese colourpoint gene and the white spotting gene. The have broad modified wedge shaped head - best described as a large piece of pie, with the corners rounded. Their ears are wide set and slightly tilted forward and the eyes are very blue, but not round in shape. The Ragdoll comes in seal point, chocolate point, blue point and lilac point although red points, cream points and tabby points are now being bred. The "colourpoints" are exactly that. The "mitted" versions have the colour points but have white mittens, white boots and a white blaze on the nose. The "bicoloured" has additional white on the stomach, chest and ruff. Genetics means that there are three other patterns: "High Mitted" where the mitts extend up legs; "Mid-High White" which is a Bi-colour with additional white in the "saddle" area; and "High White" which is a Bi-colour with even greater degree of white, the "saddle" may be absent. The colourpoint and white spotting genes interact to produce the different patterns. The three recognised patterns are colourpoint, mitted and bicolour. All Ragdolls are colourpointed and some also have white. Due to the way genes interact, some cats Ragdolls which look identical actually have different genotypes (different genetic make-up). For example, High Mitted, Mid High White and "true" Bicolour can all appear identical, though the exact amount of white is variable (almost infinitely so!) and some High Mitteds display more white than a show quality Bicolour while some Mid High Whites may have so much white on them that they appear to be High Whites! At times like this, only a knowledge of what genes the cat has inherited allows breeders to know what colour their cat really is! High White is also known as Van pattern or Harlequin in some associations and is a recognised colour in CFA (America). Ragdolls also produce pet quality variants which are not shown (except as household pets), but which have the same excellent temperament. The variants include white toes on colourpoint Ragdolls, dark toes on mitted Ragdolls, odd white marks appearing in dark areas and dark marks appearing in light areas! The white spotting is hard to get perfectly right! The Ragdoll originated in California in the early 1960s and is surrounded by myth thanks to their somewhat eccentric breeder, Ann Baker. Ann Baker bred Persian cats. Josephine was a white Persian-Angora cat belonging to Baker's neighbour; she was a semi-feral who produced kittens as wild as herself. After Josephine was hit by a car she had to stay indoors while recovering and she became somewhat tamer. While Josephine's earlier litters had been half wild like their mother, the litters born after the road accident were very relaxed, docile and social. The exact reason why is not known and later became the subject of wild claims. Since kittens inherit much of their personality from their sire, the most likely explanation is that she was breeding with different males, ones carrying genes for more sociable offspring. Judging by the kittens' appearance, Josephine's suitors were most likely Birman and Burmese. In addition, Josephine was less wild and perhaps did not train her kittens to be quite so fearful of humans. Baker decided to create a new breed, one which retained the very sociable, relaxed traits, non-matting fur, large size and the property of going limp when handled. She acquired a black Burmese-looking female called Buckwheat and a bicolour female called Fugianna. 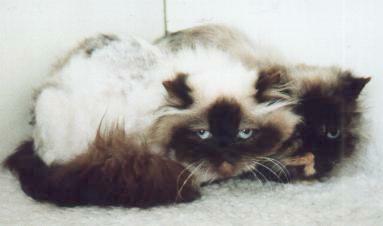 Fugianna's sire was another of Josephine's kittens, a seal-point Birman-type cat called Daddy Warbucks. There were to be no more founding cats since Josephine and her next litter were destroyed by their owner. Based on the appearance of the two founding females, Baker split their progeny into two groups: Fugianna's kittens were termed "the Light Side"; Buckwheat's kittens were termed "the Dark Side". Ann Baker formulated a strict breeding policy to preserve the purity of the Ragdoll and charged other breeders (franchisees) a royalty fee for every kitten they sold. She also made wild claims about the cats: their docility was due to changes in Josephine after she was hit by a car (a long-discredited Lamarckian theory), that while Josephine was being treated for injuries she was infused experimentally with skunk and/or racoon and/or human genes (even if done, these genes would not have entered the egg cells in the ovaries), that Ragdolls were immune to pain (they have normal pain thresholds but are remarkably tolerant cats) and even that they are a link between us and space aliens! A more plausible suggestion was that Josephine had a mutation in her ovaries and this mutation was present in the egg cells (a germ-line mutation) and was passed on to her offspring. Her claims and methods alienated other breeders, some of whom broke away to develop the Ragdoll into a registrable breed using sound breeding practices. Depending on which history you read, the Ragdoll was recognised as a purebred cat in 1965, 1966 or 1967. Also according to many sources, Denny Dayton achieved US recognition for the Ragdoll in 1967, however he didn't buy his first Ragdolls until November 1969. 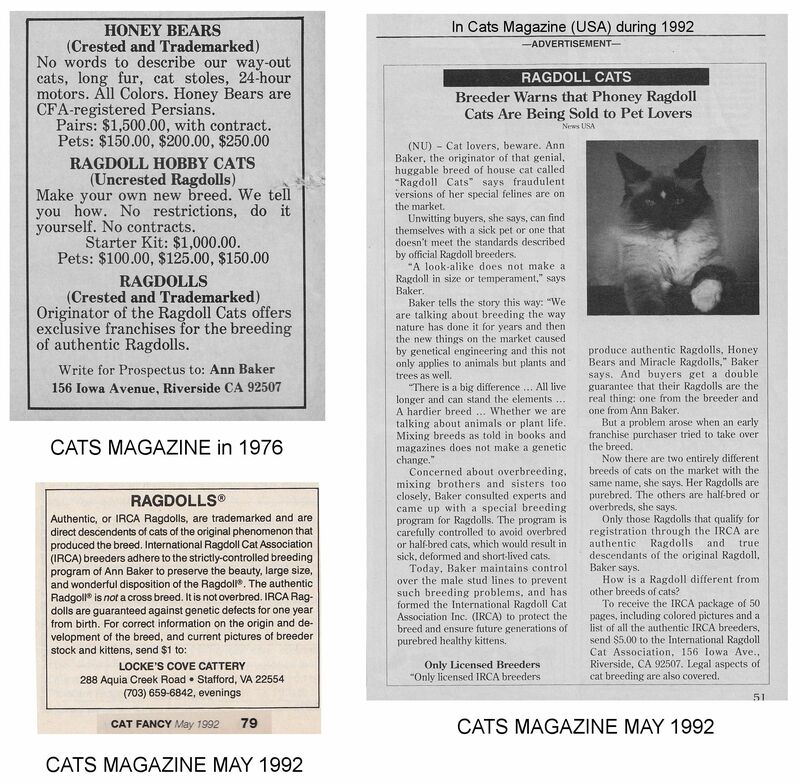 In 1971 Baker created the International Ragdoll Cat Association (IRCA) and claimed that non-IRCA cats to be fakes, frauds, look-alike, half-bred, not authentic etc while promoting her cats as the only legitimate Ragdolls. In 1975 Baker patented the Ragdoll name; she died in 1997 but her patent remained valid until 2005 and allowed only IRCA breeders to use the name "Ragdoll". Earlier breakaway breeders felt that the restriction did not apply to them because they had purchased and bred their cats prior to the time of the patent. In 1981, Ragdolls were exported overseas for the first time. According to Kay Hanvey, who was involved at the time, when Denny and GerogeAnn Dayton bought cats from Ann Baker they also had to buy special food from her. Denny, a scientist, had this special food tested by a laboratory found phenobarbitol in it. This was why the cats were so limp and relaxed and had a high pain threshold. When the Daytons broke away from Ann Baker and switched the cats to a normal diet it turned out that the cats were not so laid back and they had a lot of work to do to breed cats with a really nice personality. Denny presented the findings of the food analysis in court. When the Daytons presented the breed to TICA for recognition it was on the basis that Ann Baker could not trademark or limit the breed further and that future Ragdolls from her would not be accepted. The stories of the two types of Ragdoll ran parallel for many years. Baker's trademarked umbrella term for all of her IRCA varieties was Cherubim Cat meaning "Angels non-fighting cat". In 1985 and 1987, one UK breeder also advertised "Cherubinis" which appear to have been non-colourpointed offspring from outcrossing Ragdolls to other breeds. "Cherubini" was a legally safe equivalent of IRCA's trademarked "Cherubim" name. The IRCA Ragdolls were not recognised by any other registry and upon Baker's death, a number of breeders re-registered their Miracle Ragdolls, Honeybears and other IRCA varieties as foundation stock for the new RagaMuffin breed which is now recognised by many registries around the world. The RagaMuffin is not merely a non-pointed Ragdoll, it also has a different conformation from the Ragdoll. 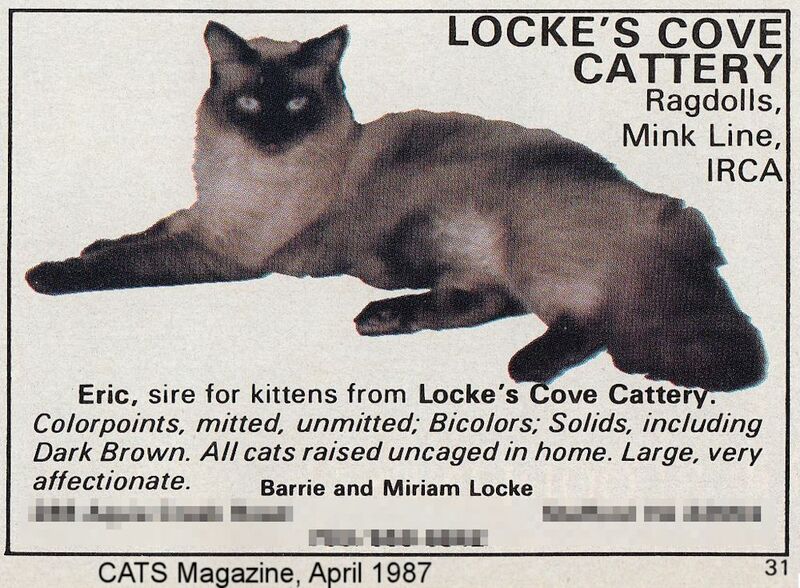 After Baker's death, some breeders tried to sell their IRCA Ragdolls as "rare mink-pointed Ragdolls" or "rare solid colour Ragdolls" to unwary owners/breeders who did not know that there had been two conflicting Ragdoll breeds. These "rare" colour cats, though attractive, were not registrable as Ragdolls in any other cat association. Throughout her life, the eccentric Baker defended her breeds and claimed that only IRCA Ragdolls were the real article and guaranteed free from genetic defect, while other Ragdolls were half-bred or cross-bred inferior lookalikes trading fraudulently on the Ragdoll name. Quarter-page advertisements to this effect appeared in an American cat magazine in 1992. Periodically, she would send threatening mail to breeders non-IRCA Ragdolls, including a mailshot that contained photos of dozens of dead cats laid out side-by-side along with a claim that someone had broken in and killed her cats (some believe Baker killed her own cats and might not have known what she was doing due to a claimed history of head trauma). The RagaMuffin is another descendent of the original Ragdolls, but in a more extended colour range. Their similarity to the accepted Ragdoll meant that many registries would not accept them, though the conformation is not the same as the TICA Ragdoll (note: the NZCF accepts "Solid Ragdolls instead). In the days when Ann Baker and IRCA were active, a there were a number of other "breeds" or named breeding lines. IRCA's other named breeds/lines were the Honeybear/Honey Bear (resembled old style Persians), Ragdoll Hobby Cat, Miracle Ragdoll ("a highly upgraded Ragdoll" formerly known as the "Ragdoll Tu", "experimental Persian" or simply "Miracle"), Baby Dolls/Doll Babies, Angels, Shu Schoo, Symoneese/Symonees, Manxees and Fuzz. The named IRCA Ragdoll/Miracle breeding lines included Maximillions (silver tabbies), Minks, Bears (thicker fur, shorter ears, rounder eyes, flatter face, cobbier body) and Catenoids (blue-eyed solids surrounded by claims they could be bred to any cat to produce an IRCA-type Ragdoll!). After the demise of Baker and of IRCA, many of these were absorbed into the RagaMuffin and some were apparently re-registered as TICA Ragdolls.